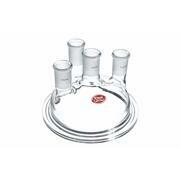 …and three side necks with full length outer Standard Taper joints that are 120° apart, these borosilicate glass reaction vessel lids have a conical flange. 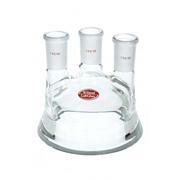 Bottom flange ID is 4" and ground for a leak-proof fit with a reaction flask. 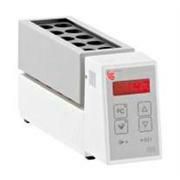 For use with reaction vessels LG-8010 through LG-8026. 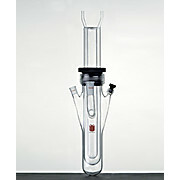 Reaction Vessel, Photochemical, Synthware, Joint: 14/20 + 24/40, #50 Internal Top Thread, #7 Arm Side Thread, 500mL Capacity. 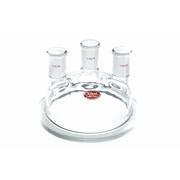 …a center neck and three side necks with full length outer Standard Taper joints, this borosilicate glass 4-neck reaction vessel lid/cover has a flat flange. 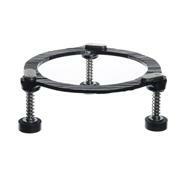 Use LG-7316 clamps. 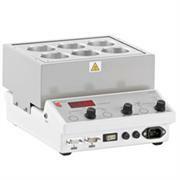 NOTE: LG-8087 is designed to be used with LG-8080, LG-8084, LG-8085, and LG-8089 cylindrical reaction vessels. 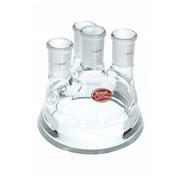 These cylindrical borosilicate glass reaction vessels are jacketed with 1/2" hose connections. 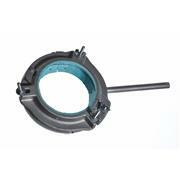 They have a tooled flat flange with an O-ring groove for a greaseless seal. 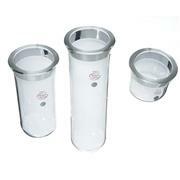 Suitable for vacuum operation. 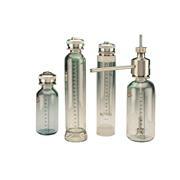 Wall thickness is uniform throughout flask. NOTE: Use LG-7316 clamps. 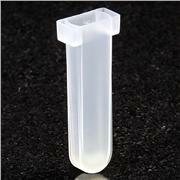 These borosilicate glass cylindrical reaction vessels have a tooled flat flange with an O-ring groove for a greaseless seal. Suitable for vacuum operation. 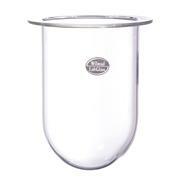 Wall thickness is uniform throughout flask. Note: Use LG-7316 clamps. 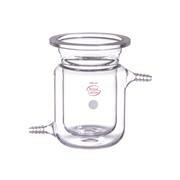 These borosilicate glass reaction vessels are jacketed with 1/2" hose connectors. 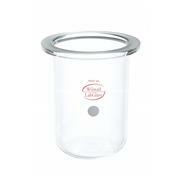 They have four indentations for improved stirring and a tooled flat flange with an O-ring groove for a greaseless seal. 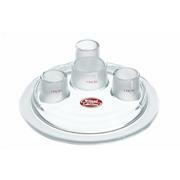 …is designed for reaction vessels/kettles with a conical flange. 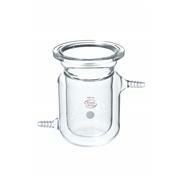 The top clamp is easily removed without disturbing the cover or body of reaction flask. Disassemble by loosening nuts. 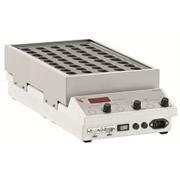 Includes extension rod for clamping to a laboratory stand. 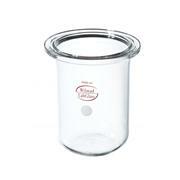 NOTE: Use with LG-8010 to LG-8050 vessels and lids. 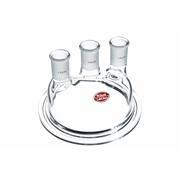 …reaction vessels that feature either a 137 x 100mmID or 168 x 130mmID flat flange. 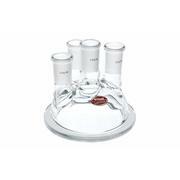 Use with our 6508 or 6510 clamps. For improved sealing of flat ground flanges, please see our 6495 product family of gaskets. 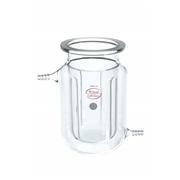 Note: vessels with o-ring grooves seal with just the o-ring supplied with the vessel. 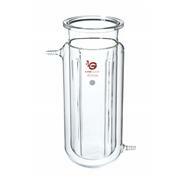 Cylindrically shaped, the upper end of these borosilicate glass reaction kettles are tooled to obtain a thickened portion and flat top.The finely ground tops create a leak-proof fit with covers LG-8030 to LG-8050, ML-1285 and ML-1286.